cyprus cultural events - Sep 29 and 30: KADS again in town - an evening of food and fun - "The older they get"
Sep 29 and 30: KADS again in town - an evening of food and fun - "The older they get"
Let me shortly introduce KADS to the reader by using an excerpt from chapter ‘Theatre’ of my book ‘Art and Creativity in North Cyprus’ …..
One day, the following summary reached me by mail. It was composed by one of the KADS members and I take it over as it is. It is quite interesting to learn about all the people involved, some well-known on the island, some who have left us for good; many directors have had their say, and many good shows were put on in places like the Grapevine in the beginning. You can see they were ambitious from the list of performances of modern plays, on stage and broadcast at BRT. My first encounter with them was in 2003 when they started having their readings at what used to be our Art Centre, the church in Edremit which was also the venue for the play “The Dock Brief’ by John Mortimer, directed by Muriel Clutten assisted by Roger Anderson. That was the only time that I saw Muriel Clutten’s husband John act – and he was a good actor – as shortly afterwards he died during a visit in South Africa. Looking through the scant files currently held by Kyrenia Amateur Dramatics Society it can be seen that in 1975 a number of people met and decided to put on three play readings, acted and in costume, to be directed by Dorothy Haile at Peter Line’s restaurant now called ‘The Grapevine’. The plays were written by the late Allan Cavender. It seems that after that the drama scene fell silent until 1987 and that productions were resumed when John Dooley directed ‘The Leper in the Temple’ by Geoffrey French, a local man, at ‘The Halk Evi’. This was followed in 1988 by two one act plays: ‘Huit Clos’ by John-Paul Sartre and Ionescu’s ‘The Lesson’, directed by John Dooley and Dorothy Haile. 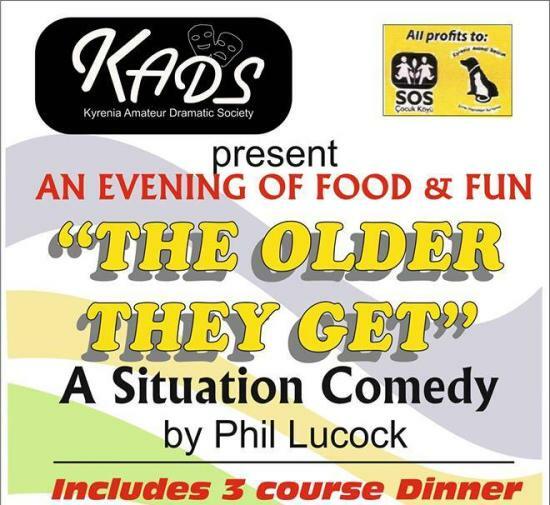 The success of these productions appear to have resulted in the group being confident enough to call the group KADS – the Kyrenia Amateur Dramatics Society. Since that time there have been the following productions….. and here the list continues up to the present. Isn’t it unbelievable that a theatre group survives this long? From 1975 onward till today. I pay my respect for the enthusiasm and the discipline, and the courage to not let it go down, because I have some knowledge of theatre work, not actively but as an observer behind the scenes. It is hard work, not only the looking for the right play, or to write one yourself as in this case, but to get the right people together and determine a plan, the rehearsals, costumes, stage set, finding a proper place to present the show, to encourage the cast and the helpers….it is a huge task. KADS have brought out this play, written by Phil Lucock, already in spring of this year. Now we will have another opportunity to enjoy this very funny situation comedy “The older they get…” on Thursday 29th and Friday 30th September at the Pia Bella Hotel in Girne. I have listened to the Radio Show on BRT just recently, so it makes one curious to see the real show….and ….it will be combined with a three course dinner which makes it a full entertaining evening. The Cast: June Lucock, Caroline Atwood, Bill MacIntyre, Diana Peek, Stephen Everett and Donald Atwood, a different cast than in the last performance; the play is directed by June Lucock. You should book your ‘invitations’ early, either at the Lambousa Saturday Market and/or Food Lodge Catalköy or call 0533 848 5313 for more information.